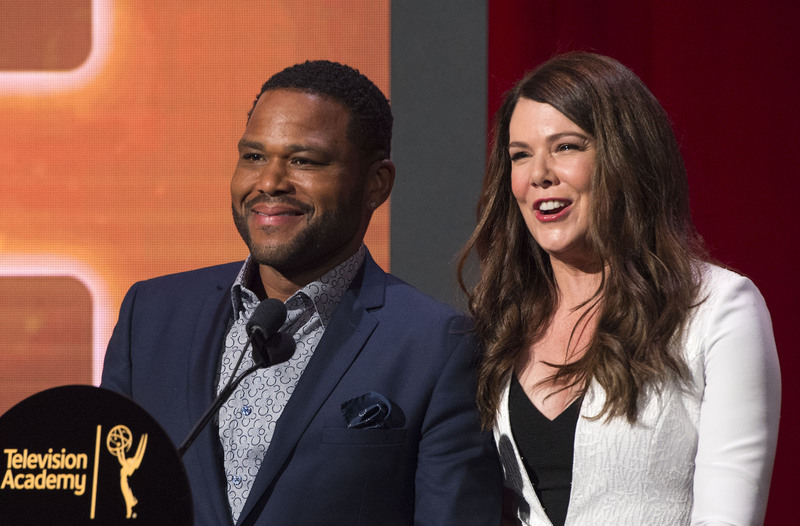 Leave it to Lauren Graham to spend one day talking to press after announcing the 2016 Emmy nominations on Thursday and to reveal some major Girls Girls secrets at the same time. The actress spoke with a number of news outlets after announcing the Emmy nominations with serious panache on Thursday, and, luckily for us, she had plenty to say about the upcoming Netflix revival. And maybe it was the high of her performance, but Lauren Graham spilled some serious spoilers from the Gilmore Girls revival. Instead of keeping mum about the revival like a number of cast members have chosen to do over the last few months, Graham spoke openly about the process of playing Lorelai after all these years and shared a number of other juicy tidbits about the four-part revival. So what were the secrets that she spilled? In an exclusive interview with People, Graham announced dramatically that she was “ruined for life” by the Gilmore Girls revival. Mainly because there is “no more perfect fit” for her than there is with “that writing and that show.” And as lovely as it is to hear her gushing over the Gilmore Girls revival, hidden between the lines of her enthusiasm is some information that fans can definitely cling to. Like the fact that the writing in the Gilmore Girls revival sounds just as strong as it was in the seven seasons on the original series. That means that fans can thankfully expect just as much wit, wisdom, and fast talking in this revival as they could out of the original episodes. Graham seemed to confirm the high quality of the new episodes during her interview. She added that filming the Gilmore Girls revival was “everything [she] wanted it to be and more.” Talk about high praise! It sounds like fans can expect to have all of their revival desires answered with these four episodes, just as much as Graham’s were. But maybe the most revealing spoiler of all, was when Graham shared the fact that she and Alexis Bledel spent most of their days shooting long scenes together: “And similar to the old show… we had long scenes to do.” OK, sure, this sounds like an offhanded comment made by Graham, but it answers a lot of questions fans had about the revival. For those of us who were wondering if some drama had sprouted up between Rory and Lorelai in the years between now and when we last saw them, it sounds like their relationship is doing just fine and dandy these days. Which is always a good thing. Not only does that mean that all is relatively well between the Gilmore girls, it means that there is even more script time to spend on the things that fans love. Like who will become Rory’s endgame in the new episodes. So keep talking, Lauren Graham. I am loving the spoilers you’re spilling.